Evadine, you're a dream. The clean lines nod to mid-century design. Upholstered in luxurious velvet with a plush channelled top for added elegance in your living room. The squared-off frame gives a fresh, contemporary feel. In a walnut stain, the solid hardwood feet are capped with brass tips to add style and practicality. Every detail has been carefully considered. Pair Evadine with the matching armchair or sofa for a show-stopping look. 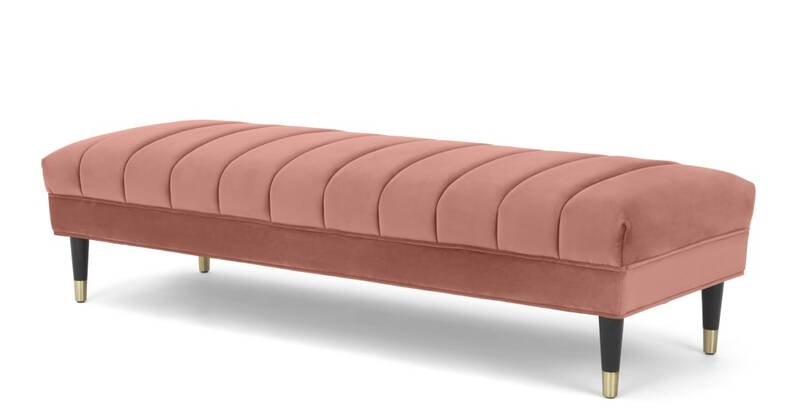 As comfy as it is wow-worthy, we think this ottoman bench will look amazing in your living room, bedroom or hallway.